In this video we show an example of an educational organization with unaligned stakeholders, a possible client for us. We hope once you found us and you recognize yourself being in this situation, please contact us! At the TU Delft there are a lot of different stakeholders involved; the board who wants to run a successful organization, the students who want to learn, but also the students who proceed their study simply because they have the opportunity. The service desk to provide service to everyone, the teachers who want to pass on their knowledge, but also a few teachers who just need a job. The canteen employees to provide everyone with food, but also the board of the canteen who wants to make money and the cleaning employees to keep the whole building clean. Wouldn’t it be great if everyone shared the same vision? If you want change in your educational organization, RADAR is here for you! RADAR is the design consultancy that ensures an aligned product/service portfolio in your organization, because we provide all people in your organization with a consistent view of your organization’s right to exist. We do this by creating an appealing story based on the explicit understanding of what the motivation for innovation is within your organization. RADAR aligns people through detection. Compare it with us being flight controllers at a big airport. With our tools we are able to detect airplanes in the air and have direct contact with each airplane. When this contact is established we have the capability to align all the planes and get them to their shared goal; landing at the airport. In real life we are aligning all the products, services and innovations in your organization by making the underlying ‘raison d’être’ of the organization explicit and communicate it with all employees in your organization and your customers. We are future oriented and are good in connecting the emotional, rational and aesthetic level, which helps us stimulating change in organizations. With several workshops and co-creation-sessions within your organization we will develop a clear story about the ‘why’ of your organization. It is important for all employees and customers to know what your organization is trying to achieve, to be able to create perfect aligned new solutions and products. We will make a communication tool to share this message, this can for example be a video, website, brochure or one of our many other possibilities. We divide our work in three phases. First we will organize a meeting with representatives of all stakeholders, for example the board, teachers, students and all other supporting employees like people at the service point, cleaners and canteen personnel. 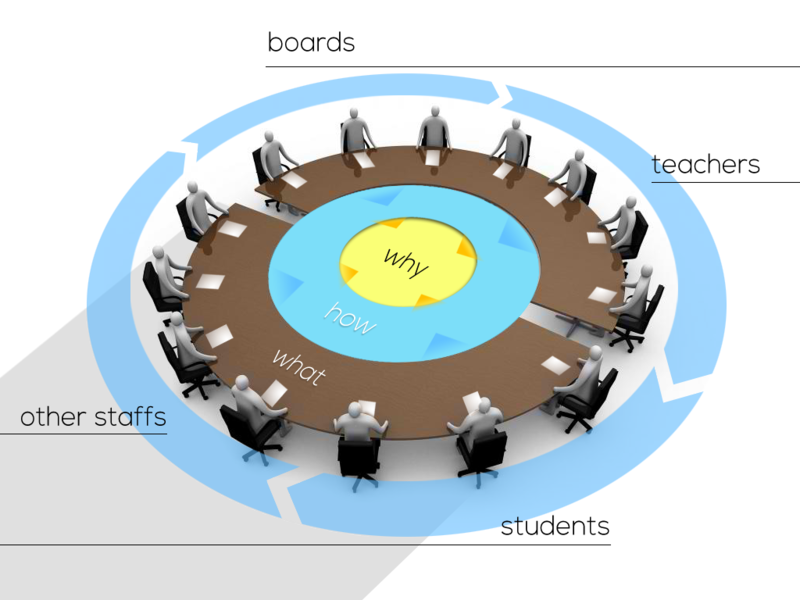 We will use creative techniques like co-creation sessions and being present in meetings at all levels of the organization to create an overview of how all stakeholders perceive and contribute to your organization on the ‘what’, ‘how’ and ‘why’ level (golden circle). Second, together with the same people as in phase one, we will create a shared understanding and agreement of how the organization should look like in the future. The final strategy will be adjusted according to the insights we came up with during these sessions. This phase will result in a description of a fictive person in the near future in the form of a persona. Each stakeholder will be represented by one persona and will go through a customer journey to see how all stakeholders are acting within the organization. In the third and last step we will create a story through which we will communicate this understanding with all people involved in your organization. 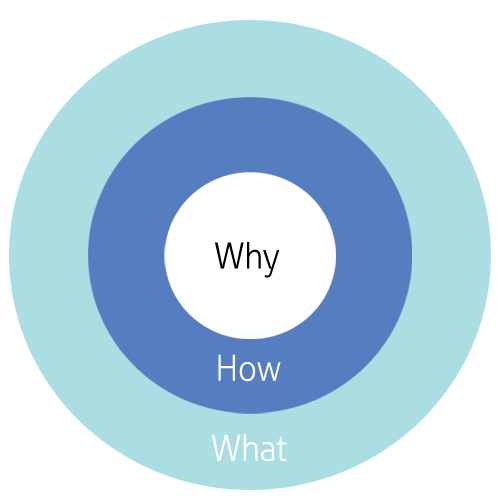 This story will explain what the ‘what’, ‘how’ and ‘why’ of your organization are, in such a way that all people will understand it. We will help your organization with implementing the tool and make sure that all the touch points deliver the same kind of value to the customer. Storytelling is an unique way to create a similar bond between people. Never has there been another form of communication that succeeded like this, since man started telling tales around campfires (Saelens, 2014). According to Saelens, storytelling is “the oldest form of brand promotion in the world, and like fashion it always comes back… it never really goes away.” By the use of storytelling it will be clear for everyone what the message is you want to tell them. Alignment is the key for maximizing effectiveness of marketing and branding efforts. For us, a great example is the humble company Tony’s Chocolonely. This company aims to make the chocolate industry 100% slave-free through selling quality chocolate bars. Tony Chocolonely “cares about people” and likes “a bit of fun along the way.” Everything this company does contributes to delivering brand focus and putting their core message out to the obvious. The fact that this company started with a clear ‘why’ results in alignment through all touch points of the brand. The chocolate bars are divided in unequal parts to show that not everybody in the distribution channel gets an equal part now, and packaging is made of recycled paper and clearly puts the message out with an alarming red colour. The fun side of the company also shows on the package, the fair at which they present their annual report and social media. By this Tony Chocolonely is now a successful brand within the Netherlands with ambitious goals in terms of expanding their business. A true example of great alignment ! Stijn is a ginger boy, he likes working in the most efficient way with emphasis on the content. Presenting something prettier than it is, is out of the question. When he is passionate about something, watch out, you will not get rid of him again. Jojo is our Chinese girl, she is the one visualizing most of the work, in this way our pretty thoughts look pretty as well. Jojo has the most patience, which reflects in her care for others, not only for the team, but also our clients and everyone else we work with. Our second girl, Myrthe, has a questionable hair colour, some call her blond, some call her ginger. She herself prefers calling it strawberry blond. She likes to devote herself to tasks which she picks up in a very structured and organized way. Want to talk to someone? She won’t shut up, so at least your break will be filled. Bas is our second curly boy, he has never had a bad hair day in his life. Bas also likes working in a efficient and organized way, if you want something done, ask him and you know it’ll be perfectly done before you know it. Because of his overview, nothing gets lost in this powerteam and the end result is 100% complete.